This is the new Caterham-Lola SP/300R, just unveiled at the 2011 Autosport show. The Caterham Lola SP/300R is built using Lola’s CFD (Computational Fluid Dynamics) technology, on an aluminum tubular chassis. The Caterham Lola SP/300R has a longitudinally mid-mounted engine architecture coupled to a stress-bearing rear transaxle. For better aerodynamics, the Caterham Lola SP/300R is fitted with a forward splitter and large rear wing that work together with a flat underbody to maximize the ground effects. Caterham Lola SP/300.R: A 0K Prototype Racer The suspensions a full race setup with front/rear dual wishbones with pushrod dampers, adjustable height, and custom wheels. Its a setup similar to what the Lola Formula 3 cars use, but wrapped in a sleek and downforce-creating body. With power extracted from a 2.0-litre Durated unit from Ford linked to a semi-automatic Hewland gearbox, the Caterham Lola SP/300 R is able to develop 300 bhp, and should take onlu 2.5 seconds to accelerate from 0 to 60 mph. Top speed is 170 mph and considering the Caterham Lola SP/300 R tips the scale at below 600 Kg, its power to weight ratio is 500 bhp per ton. DNA to deliver all the thrills of driving a fast, but confidence-inspiring, sportscar. 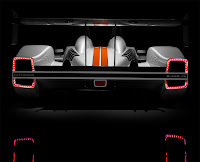 Created in partnership with another iconic British engineering brand, Lola Cars, the aesthetically-sensitive sports prototype will also feature the debut of Caterham Motorsport’s new supercharged version of the Ford Duratec power plant, expected to produce around 300bhp. Caterham is in the final stages of development of the powertrain and handling characteristics of the car, in readiness for a one-make championship to start in 2012, while the feasibility of a road-legal version of the car is also being considered. Only 25 SP/300.Rs will be manufactured each year, allowing Caterham to focus on enhancing the build quality of every vehicle and maximising its renowned one-to-one customer service. The car will provide the ‘top end’ natural progression for Caterham’s already successful domestic and international racing ‘ladder’. It will also provide the blossoming premium trackday community – both home and abroad - with a potent new model. Bearing subtle design cues from the Seven, the first new model from Caterham since the 21 road car reproduces the Company’s core motorsport values of affordability, reliability and accessibility. With Lola, as technical design consultant, leading the aerodynamic styling and downforce development in collaboration with Caterham’s design direction, the Seven’s engineers have been responsible for developing the power plant, braking system and making sure the two-seater’s renowned ride and handling characteristics are firmly transferred into the SP/300.R. While the global expansion of the Seven’s motor racing activity will continue unabated, the SP/300.R will allow Caterham’s loyal clientele to move further up the performance racing ‘ladder’ without having to leave the proven expertise and ‘value for money’ of the Company’s motorsport infrastructure. The beating heart of the SP/300.R will be a Caterham-tuned, supercharged version of Ford’s 2.0L Duratec unit, which will produce 300bhp. The Company’s long-standing relationship with Ford continues to allow Caterham’s engineers unparalleled technical access to the Ford range of engines. Today, Ford products power the entire range of Caterham cars, from the entry-level Roadsport through the entire Superlight collection. Caterham’s engineers have chosen the supercharged Duratec with its drivers in mind. As with all Caterham products, the driving experience is at the core of the SP/300.R’s design. The supercharged induction module has therefore been chosen for its linear torque delivery across the entire engine speed range, which is perfectly-matched to the lightweight architecture of the car. The Duratec unit is well-known to Caterham’s engineers and already boasts a proven track record as a resilient engine that is cost-effective for customers to run, while other offerings feature a more ‘all or nothing’ character and require further refinement before Caterham will consider using them. Caterham has worked alongside partners such as Pectel to deliver a highly-developed package that will reward drivers with advanced data logging and features such as ‘push to pass’ power enhancement and an integrated semi-automatic gearshift control. The SP/300.R will be capable of being adapted to suit alternative engines but the factory-fit engine will offer unrivalled levels of reliability – together with a perfectly-matched Hewland semi-automatic FTR transmission, Caterham aims to reproduce the enormously-durable drivetrain solution that has been so successful in the Superlight R300 series, where engine rebuilds are virtually unnecessary. The rich racing heritage of the Caterham Seven and Caterham’s motorsport expertise will ensure the success of the Company’s expansion into sports prototype racing. However to achieve that end, Caterham has teamed up with the world’s leading manufacturer of customer race cars, Lola Cars. Its expertise, particularly in the sports racing category, was invaluable in the creation and styling of a bespoke chassis that forms the basis of the SP/300.R. With the styling aerodynamically, rather than aesthetically led, the SP/300.R has been designed using Lola’s state-of-the-art CFD (Computational Fluid Dynamics) technology, with input and critique from Caterham. The basic chassis is an aluminium tub with a longitudinally mid-mounted engine, coupled to a stress-bearing rear transaxle. A forward splitter and large rear wing reduce lift, while a flat underbody maximises ground effect benefits. A broad aero platform generates optimal downforce and balance, while the aerodynamic performance is fine-tuned by ducts and dive-planes. The SP/300.R bodywork also features an F1-style raised nose section and sectioned panels, which will help reduce repair costs, ease maintenance and, importantly, allow single-handed removal of body panels track-side. Caterham’s research suggests that most sports prototypes in today’s market require more than one person to assist in the removal of body panels, e.g. oil check, set-up, etc; the SP/300.R will be the only sports prototype that offers this unique, flexible and yet convenient feature. The car also takes subtle design cues from the instantly-recognisable Caterham Seven; for instance, the Seven’s grille shape appears beneath the raised nose of the SP/300.R. The pairing of Lola’s world-beating aerodynamic package with the Ford engine will produce a car that will easily meet the desires of Caterham customers, whether they are seeking their first serious step into sports prototype racing or the ultimate trackday machine. The supercharged Duratec’s 300bhp will propel the sub-600kg car from 0-60mph in around 2.5 seconds, translating into 500bhp-per-tonne, excluding the driver. The gearing of the car has been selected to reach maximum rpm in top gear at the end of Spa-Francorchamps circuit’s Kemmel Straight, chosen as it is one of the more frequently-visited race and trackday venues. Top speed will be around 170mph. The SP/300.R will benefit from full race suspension – front and rear dual wishbones with pushrod dampers, adjustable ride height and bespoke wheels and tyres will all make for a race car of exquisite balance and stability. The rear suspension architecture is derived from that used at the rear end of the Lola Formula 3 and World Junior cars – coupled with the high downforce generated by the aerodynamic package, this will be a direct and rewarding race car to drive. Thanks to Caterham’s long-standing partner, Cooper Avon Tyres, the SP/300.R will stand on bespoke rubber developed specially by Cooper Tire for this car. Cooper Tire provides tyres for the British Formula 3 International Series, acknowledged as the toughest domestic single-seater championship in the world and a recognised ‘stepping stone’ to Formula 1. The SP/300.R’s tyres are fitted to 13-inch race rims. Measuring a muscular 250mm wide at the rear, and 180mm at the front, the tyres have been specifically designed to cope with vast engine torque married to a lightweight chassis. Naturally, the SP/300.R has been built to comply with MSA safety regulations. The main component of the safety system is a roll cage, which has been designed specifically for the car and incorporated into the styling schemes. The chassis has also been designed as a race chassis with the requisite crash structures. Other components include the six-point harness, fire extinguisher, cut-off switch and so on. In keeping with the SP/300.R’s stature as a premium race product, Caterham has selected fixings and fittings of a very high quality. These include the steering wheel, which incorporates data display (Stack/MOMO), wheels (ATS, Speedline or OZ), brakes (AP Racing) and driver’s harness (Schroth). With Caterham’s vastly rich heritage in motorsport - both domestically and internationally - it is no surprise to find that Caterham Motorsport is planning a prestigious one-make series in which the SP/300.R will star. The details of its own championship are yet to be finalised, but the SP/300.R series will initially focus on UK circuits, with the potential addition of one round abroad. However, the projected success of the cornerstone debut season is expected to make the SP/300.R and its race series eminently marketable further afield in Europe, which will provide a major boost to Caterham’s already thriving export market. Caterham has proven over the last 25 years that it is expert in producing and managing world-class motor racing championships and events. The Company’s motorsport ‘ladder’ provides a cost-effective, easy-to-run solution for drivers of any ability to get into racing, from complete novices with the Academy series to the Superlight R300 for seasoned semi-professionals. The Caterham Academy, which takes novice non-racers through the process of getting their race licence to enjoying their first season of competitive action, has become one of the UK domestic scene’s lynch pins, creating around 750 brand new racing drivers since its inception in 1995. It is the proven organisational expertise and infrastructure that will run the new one-make championship for the SP/300.R, starting in 2012. The Caterham-Lola SP/300.R is priced at £60,000, excluding local taxes.